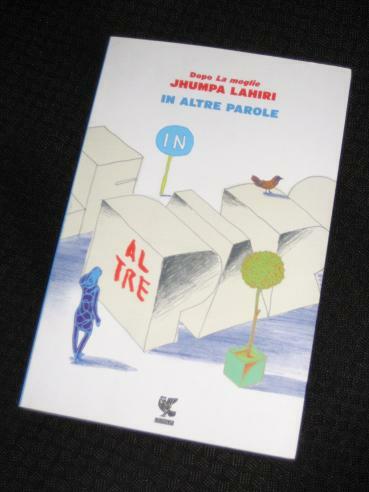 Jhumpa Lahiri’s In altre parole (Ann Goldstein’s English translation, In Other Words, is available from Knopf in the US and Bloomsbury in the UK) is a slightly different book to my usual selections. Already an award-winning writer in English, Lahiri found herself wanting a new challenge, and where most people would probably just take up pottery, she decides to take her passion for Italian to extremes. Intrigued by the language since visiting Europe as a student and backpacker, she takes lessons, visits Italy and even attends events in her new language. Still, while her language skills do slowly improve, she never feels as if she’s really getting inside the language, so she makes the decision (a rather big one…) to move to Rome with her family. Once immersed in the language, she finally feels she’s making progress, eventually plucking up the courage to actually begin writing in Italian, with this book being the result. But while she is happy with her improvement, is she just kidding herself? Can she really become an ‘Italian’ writer, and is she losing something else in the process? When I first heard about this book, I was torn between interest and cynicism. As someone who dabbles (!) in languages, the story intrigued me, and (to be honest) made me a little envious too – many’s the time I’ve wanted to run off and improve my language skills, leaving my ‘normal’ life behind. However, it was also hard to stifle a feeling of annoyance, a suspicion that this whole project was merely the arrogance of a successful writer. There was every chance that this could be another A Year in Provence, the story of a rich, entitled family off on a fun sea change in a foreign country. In altre parole contains a little of both of these extremes, but the more I read, the more I enjoyed a book that is, in truth, less about Lahiri’s time in Italy and more about her growth as a writer and an Italian speaker. It consists of a series of short essays (originally published in a newspaper) plus two short stories, one integrated into the book, the other an addition at the end, showing the writer’s achievement in creating fiction in a foreign language. Voglio attraversare un piccolo lago. È veramente piccolo, eppure l’altra sponda mi sembra troppo distante, oltre le mie capacità. So che il lago è molto profondo nel mezzo, e anche se so nuotare ho paura di trovarmi nell’acqua da sola, senza nessun sostegno. I want to cross a small lake. It is truly small, yet the other side appears too far away for me, beyond my capabilities. I know that the lake is very deep in the middle, and even if I know how to swim, I am afraid of finding myself alone in the water, without any assistance. A new language brings a new joy, a different way of reading (I fully concur with her views!). Com’è possible, quando scrivo in italiano, che mi senta sia più libera sia inchiodata, costretta? How is it possible that, when writing in Italian, I feel both freer and more fixed, constrained? It’s all fascinating stuff, but let me play Devil’s Advocate for a while. If Martin Amis or Jonathan Franzen did this, most readers would undoubtedly slate them for it, accusing them of privileged whingeing, so why should we applaud Lahiri for her busman’s holiday? I’m not a fan of this kind of self-indulgence, and books like Susan Hill’s Howard’s End is on the Landing or Sarah Moss’ Names for the Sea tend to leave me cold. With a Bengali background, Lahiri has struggled in the past with her identity as a ‘native’ English speaker whose face doesn’t always fit. She talks about her parents and their struggle to retain their roots, in contrast to their daughter who is neither completely American nor Bengali. This identity crisis spills over into her life in Italy, with strangers complimenting her husband’s poor Italian while addressing her in English. The drive to learn Italian can be seen as an attempt to find a new identity, one which only makes her more of an outsider than she was before. In the first story included in the book, ‘Lo scambio’ (‘The Transformation’), Lahiri writes about a woman in a strange land, travelling light, with little but her black sweater. While trying on some clothes, she loses it, putting on a different sweater by mistake. She complains about the loss, but later becomes aware that the sweater might be hers after all – she’s the one who has changed. As the writer explains, the story is a metaphor for the change which has come over her because of her linguistic endeavours, showing the uncertainty she feels every day in her new life. Overall, I enjoyed In altre parole a lot. I’ve never tried Lahiri’s work in English, but she’s obviously an accomplished writer. I appreciated the metaphors she uses and the way she organises and ends her pieces, and the two stories both had something about them. This is definitely a book to recommend, especially as the English version is bilingual (something I didn’t know when I bought my edition!). I did get a sense, though, that while I can pat myself on the back for reading a whole book in Italian (with occasional glances at Google Translate on my phone), this wasn’t the real thing. Even I could see that the style was simple in places, with frequent repetition of structures and certain words used over and over again (Lahiri herself admits at one point to using some words as life preservers), and if I could understand it with no major issues, I wonder what a native Italian would think. If you’re looking for books by Italian women, I suppose there’s no getting past Elena Ferrante and her Neapolitan Novels, but don’t forget that she’s written other books too. One of my favourites is the frantic The Days of Abandonment, and Troubling Love is also a great read. Another writer I admire is Viola Di Grado. So far she’s had two books out in English, and while her most recent work, Hollow Heart, hasn’t got a lot of attention, her first, 70% Acrylic 30% Wool, has a lot of fans. Both of these women are published in the Anglosphere by Europa Editions – given that it’s a press owned by an Italian publishing house, it’s unsurprising that Europa have a big focus on Italy. Other women on their books include Simonetta Agnello Hornby and Milena Agus, so if you’re a fan of Italian fiction, you could do worse than check out their site. It does sound hugely privileged and self-indulgent, and I’m not persuaded intersectionality is that great a defence to that. Lahiri’s is hardly a marginalised voice. Also, these writers who go for a year, they’re tourists pretending to be something more. Tim Parks by contrast actually moved to Italy, raised his kids there as Italian kids, is now a published Italian writer. He’s an emigrant, or from an Italian perspective an immigrant. The “do a year” writers are gap year kids, who to paraphrase Pulp can call their dad (or bank manager) and stop it all. There’s nothing wrong with being a tourist, I’m one often enough myself, but I don’t really want to read a book about someone else’s holidays. More problematically, I thought the Italian read like English. They read like English sentences to me, but using Italian words and grammar, not like natural Italian sentences. They also seemed possibly a little fussy and as you say rather simple. My spoken Italian is pretty good, but normally I can’t read literature in Italian. These I could read easily. I’d put the language closer to the level of Dylan Dog or Martin Mystere (both of whom I like to be fair) than Italian literary fiction. Max – I understand where you’re coming from , but I think there are many shades between the gap-year experience and the full emigrant, and there’s enough here to make her experience interesting to more than just her family and fans (also, I’m not a huge fan of Park’s nasty sniping at other translators, but that’s another story…). Yes, she’s not the most underappreciated writer out there, but she does have an interesting story to tell, and even if she’s gone back to the States, I’ve heard she’s now translating a book from Italian, something more writers should do. A shame Parks does that. I didn’t know and it’s unattractive. Oh well. Anyway, I don’t mean to slam a book I’ve not read and clearly you enjoyed it. Probably one I’ll pass on though. The translation thing is actually more interesting, given she’ll be bringing from the Italian into English. Max – This is a book I enjoyed, but that’s not to say that I think it’s a great book, and there’s a definite aroma of privilege wafting around the whole project. However, for me, reading it in my woeful Italian, it was the right book at the right time (I suspect that I wouldn’t have liked it as much in English!). Elizabeth – It’s a fine line, and I’m not convinced he always keeps his balance. Some of his comments on, for example, Ann Goldstein’s work and Han Kang’s ‘The Vegetarian’ were pretty nasty in my view, but others may disagree.